← Would You Like to Vionnet? Wow, that look awesome Steph. I really must dig mine out and finish it as well. I definitely love the orange, makes a statement. 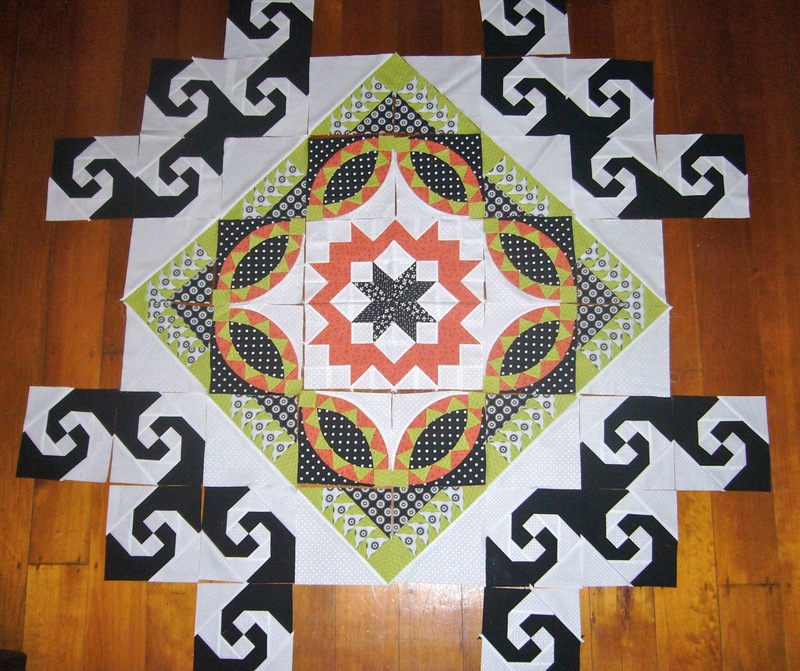 Mine is the hot pink, lime green combo that Susan used in the original pattern. Keep up the good work, and I look forward to seeing the completed quilt once you’ve finished. Hi Steph, I Love the Surveyors Compass block, but maybe in the circle where there is the black spots on white fabric, just that little splash of orange would give it a bit of a zing. 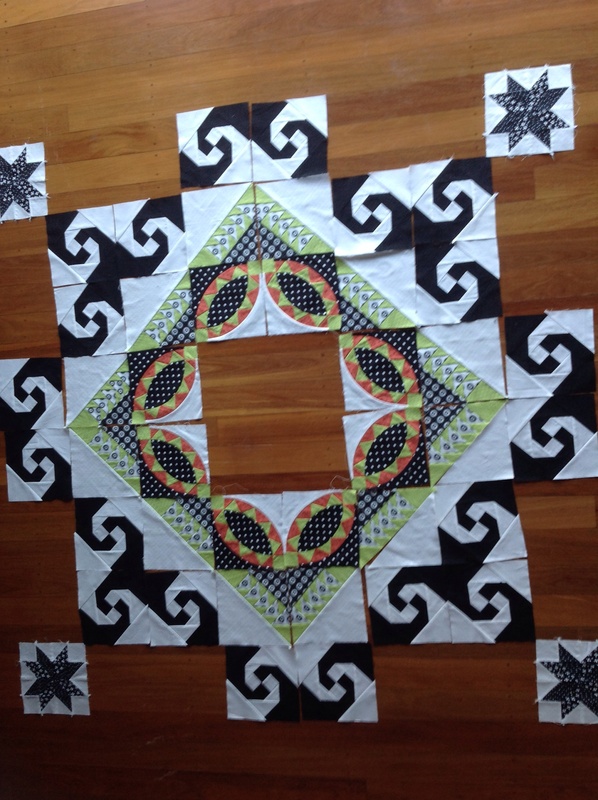 Oh the black art of the quilter! I like the orange very much. I think I might bring the orange into the border, and I do like that last arrangement (to the right/bottom of page). Orange isn’t one of my “happy colors” either, so … I’m totally there with you about minimizing it – but a squink in the corners to finish the piece could be pretty. UFOs: I have a daydress that’s in pieces from before-I-knew-how-to-fit-princess seams, and I’m dreading sewing it up and finding out what horrors I’ve inflicted upon innocent polkadotted fabric. Otherwise nothing truly “UFO”, although I have a project on backburner and shelves full of fabrics that are finished garments only in my head. Working on a coat now. I think you’re right, Hearthie, just a little glint of it here and there, so it’s deliberate indstead of isolated. Once I finish the “square” in the middle, I think I should add another row at the top and the bottom because my bed is very rectangular… Might put a tiny small border in there, wonder if the oraneg would work there… Hmmm…! Steph. You’re brilliant. I wouldn’t have thought of that, and I don’t have a single knee-length skirt right now. BRILLIANT. Thank you! Gorgeous but I’m a bit biased a sI’m working on my big quilt top right now and loving it. I adore the orange, but you have to decide as you’re going to have to live with it!